The Laserkey is an innovative input device that projects a full-sized virtual keyboard on to any flat surface for rapid text-entry. In one word, FANTASTIC ! Despite the long delivery wait (~1 month without any explanation from MOBILEFUN...), I'm amazed with this equipment performance both in my PDA and in my Computer. It also brings one function that is not mentioned anywhere. it can emulate your mouse also!!! (it can alternate between Keyboard OR Mouse). 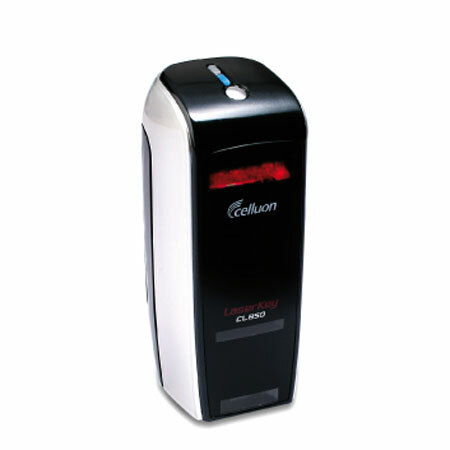 The Celluon Laserkey CL850 is a wireless virtual keyboard that lifts wireless mobile communications to a new height. The Laserkey is a smart, pocket-size device that projects a full-size keyboard through infrared technology onto any flat surface. 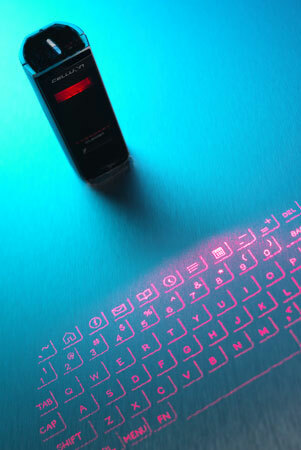 Users could then type on the infrared images as if typing on conventional keyboards. Based on the QWERTY layout, the 19mm keys of the Laserkey CL850 enables highly sensitive and accurate input of data on the go, compared to existing technologies such as Graffiti or Thumb keyboards in mobile input performance. The Laserkey CL850 is smaller than most traditional keyboards and easy to carry along with your mobile device. With the absence of physical buttons, the Laserkey relieves the user from fatigue and helps minimize the ergonomic discomfort inherent in other traditional data input keyboards. Laserkey's wireless capabilities with built-in Bluetooth enables a cable free connection with other Bluetooth-embedded applications such as PDA's, Smart Phones or PC's. The Laserkey CL850 also has no moving components, and thus more reliable compared to other technologies that encompass numerous mechanical parts. 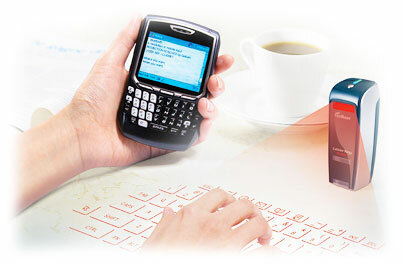 Keyboard data entry and use of the mouse can be achieved through Laserkey's electronic perception technology, which tracks finger movements on the projected surface (mouse functionality subject to operating system support). Light Source: Red laser diode. 19mm sized QWERTY / AZERTY / QWERTZ layout. Keyboard Position: Approx 100mm from keyboard device. Projection Surface: Non-reflective, opaque flat surface. Keyboard Stroke: Built in buzzer (mute on / off the sound). Visibility : Visible in 1000-5000 lux ambient light. Illumination: Visible in incandescent light of 1800 lux or more. Detection Rate: Up to 400 characters per minute. Effective Key Stoke: Approx 2mm. Operating Surface: Any flat surface. Windows Mobile Pocket PC & Smart Phone Edition.